It is fair to wonder why there is a need for ESD wastebaskets. If the basket resides underneath a workstation, and stays there permanently, the need may not exist. Worksurface Cleaning: An operator lifts the wastebasket to the edge of the workstation to collect the debris being removed. Should a static-sensitive product be present on the worksurface and not contained in a shielding container, there is a good opportunity for exposure to electrostatic fields that exceed safe limits. Lead Trimming/Board Cleaning Operations: When trimming component leads or using aerosol cleaners on PCBs (Printed Circuit Boards), some operators will hold the PCB over a wastebasket to catch the clippings or solvent run-off. Many times, the PCB will be placed well into the waste container to assure catching the unwanted materials. This operation puts PCBs and ESD-sensitive devices very close to potentially significant electrostatic fields. Aisle Proximity: Some wastebaskets have been observed in close proximity to production floor aisles, where product transfer carts pass or may be parked. ANSI/ESD S2020 requires items that generate 2,000 volts or more (measured at 1” from the item) be kept at least 12” from ESD-sensitive devices. Using ESD wastebaskets eliminates the risk of carts being parked next to static-generating baskets. While company ESD policies may prohibit some of the actions mentioned above, it does not mean that they will not occur from time to time. 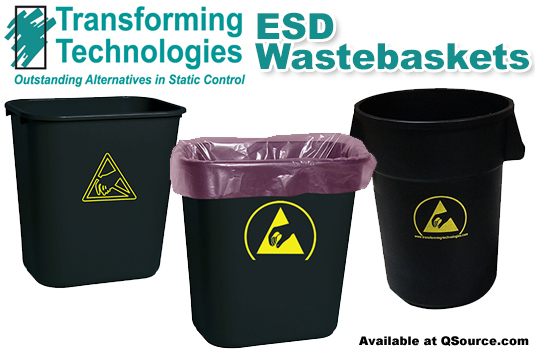 ESD wastebaskets provide assurance that the wastebasket will never be an ESD threat to your product. Transforming Technologies offers ESD wastebaskets in static-dissipative polypropylene and in stainless steel for cleanroom operations. If a liner is to be used for easier maintenance, Transforming Technologies offers them in both conductive and static dissipative. Surface Resistivity: ‹ or equal to 1011 ohms/sq.